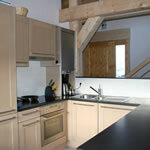 Chalet Sauterelle offers luxury accommodation for groups of up to nine people. The master bedroom is en-suite and has a luxurious king sized bed. Three further bedrooms, two twin and one twin/triple, share two bathrooms, one with full sized bath. All of the bedrooms lead onto balconies or terraces and of course all have amazing views. 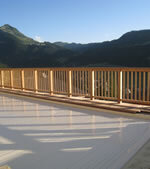 New for the 2009/10 season is a 7 person hot tub an ideal place to ease those post skiing aches whilst making the most of the stunning sight of Morzine beautifully lit up at night. The main living area is a large open plan lounge, dining area and kitchen. The well fitted kitchen has a full sized hob, oven and dishwasher, microwave and large fridge-freezer. 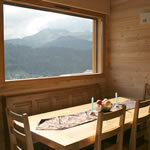 The adjacent dining area seats nine people comfortably, with spectacular views over Morzine and the Pleney slopes. The lounge area has two large, comfortable sofas around a modern wood burning fire. The attached balcony offers a perfect place to enjoy a cool drink as the sun sets behind the mountain and is the ideal place to watch the fireworks and torchlit descents. The floodlit evening skiing on Pleney also provides plenty of entertainment! There is a further sitting area on the large mezzanine. Two more sofas are a great place to keep an eye on the “chef” through the smart glass balustrade. A flat screen TV, DVD player and UK TV are provided. 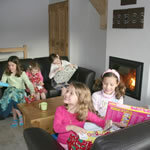 For any children in the party there is a small cushioned area, perfect for storing toys and playing games, a selection of which can be found in the chalet for guests’ use. Under the chalet is covered parking and the heated ski room is found at the back. This is for the exclusive use of the chalet and is lockable. Plenty of hanging space and shelves are provided to ensure no-one goes out with soggy clothes. It is also the perfect place to store bikes in the summer. There are a number of lifts within a 5-10 minute drive making the whole of the Portes Du Soleil accessible. Parking at the lifts is plentiful, and usually free, making getting around stress free. Should you wish to use the ski bus it is a short walk from the chalet and takes guests to the Super Morzine lift. An easy 15-25 minute walk (depending on which end of the town you wish to be in) will take you to the numerous bars and restaurants of Morzine, and taxis are plentiful if you don’t fancy the walk home. It is possible to arrange full/part catering, a nanny service for the little ones or additionally lift passes, airport transfers, car and ski hire and welcome packs - all subject to availability and at extra cost. Please ask for details if you are interested in any of these services. Having three children ourselves we can also offer advice on ski schools and other activities if you are new to skiing or the Portes Du Soleil area. 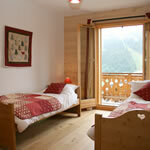 Upon arriving at the chalet you will be met by our in-resort contact who will show you around the chalet. All bed linen, towels are cleaning during your stay are provided at no extra charge. After too many ski trips in cramped, uncomfortable accommodation we have designed our chalet with the needs of our guests in mind so you are assured a comfortable, relaxed stay in our spacious, contemporary but comfortable home from home. All cleaning is included at no extra cost along with arrival service and in resort contact during stay. 20% deposit to secure booking, balance due six weeks prior to depature.